Broadway In Chicago and Producers Tommy Mottola, the Dodgers, Tribeca Productions and Evamere Entertainment announced that A BRONX TALE will make its Chicago debut at Broadway In Chicago's Oriental Theatre (24 W. Randolph) for a limited engagement March 12-24, 2019. A BRONX TALE will be part of Broadway In Chicago's upcoming season. Subscriptions will go on sale in the fall of 2018. A BRONX TALE will join the line-up of performances at the annual Broadway In Chicago Summer Concert, sponsored by ABC 7 Chicago and hosted by Janet Davies, ABC 7 Chicago's entertainment reporter and host of the entertainment and lifestyle program 190 NORTH on ABC 7. The Broadway In Chicago Summer Concert will take place on Monday, August 13, 2018 at 6:15 p.m. at the Jay Pritzker Pavilion at Millennium Park (201 E Randolph St). The new musical features a book by Academy Award nominee Chazz Palminteri, music by Oscar, Grammy, and Tony Award winner Alan Menken, and lyrics by Grammy Award winner and Oscar and Tony Award nominee Glenn Slater, directed by two-time Oscar winner Robert De Niro and four-time Tony Award winner Jerry Zaks, with choreography by Tony nominee Sergio Trujillo. 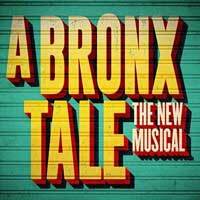 A BRONX TALE premiered at the Tony Award-winning Paper Mill Playhouse to critical and popular acclaim in Spring 2016. Based on the one-man show that inspired the now classic film, this streetwise musical will take you to the stoops of the Bronx in the 1960s-where a young man is caught between the father he loves and the mob boss he'd love to be. Featuring an original doo-wop score, this is a tale about respect, loyalty, love, and above all else: family.